How long does it take to chart 50 million galaxies? 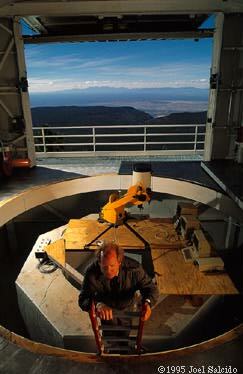 The Sloan Digital Sky Survey hopes to finish in five years. At the Apache Point Observatory, Bruce Gillespie surveys the site of a new telescope, scheduled to arrive this month; photograph by Joel Salcido. SURROUNDED BY FIR TREES, a small group of astronomical observatories dots a 9,180-foot peak in New Mexico's Sacramento Mountains, not far from the Texas border. The nights here are usually cloudless and exceptionally dark. In the jargon of astronomers, there is good "seeing"--an evenness of the air valued alike by stargazers and airplane passengers, whose alternative is turbulence. An hour's drive from the nearest grocery store, the Apache Point Observatory is, as one staff member puts it, in "the loneliest part of the country." Amid the observatory's domed structures sits a garage-like building on a pier that juts out from the flat summit's edge. Mounted on tracks, the garage rolls back to expose a large hole. Just below, a massive, eight-sided, concrete column points heavenward. The top of this column looks like a good place to land a small flying saucer. On April 21, in fact, something will land there: a telescope different from any other. Like a child lying on her back watching the heavens slide by overhead, the telescope will hold a position that allows stars and galaxies to drift across its camera, creating pictures in a long, continuous strip. The instrument is being built with one object in mind: an "atlas" that will bring to Earth a look at more of the universe than has ever been seen before--50 million galaxies, filling a three-dimensional region 100 times larger than previous sky maps. For the first time, astronomers will chart a large enough volume of celestial space to study, in depth, the large-scale structure of the universe--forms like clusters of galaxies pulled together by gravity, clusters of clusters, and huge empty zones called voids. Plotting such objects offers a way to test competing theories of the universe's early evolution and ultimate fate. In a very real sense, the resulting map will describe our place in space and time--the definitive "You Are Here" signpost. With these grand goals come equally impressive statistics. The Sloan Digital Sky Survey--a project being overseen by the Astrophysical Research Consortium, a group of schools including Chicago--will produce enough raw data to fill eight million floppy disks. Its cost, while modest by Big Science standards, is $41.5 million. This spring and summer, the New Mexico mountaintop will become a staging ground as parts are assembled, tested, and refined in hopes of beginning the survey by spring 1996. A small army of contractors and the labs of more than 60 astronomers at seven institutions, including the University of Chicago, have labored for five years to build not just the telescope but also equipment, expertise, and computer software. The big job ahead, surprisingly, doesn't require bigness in all its details. Were the astronomers using the world's largest optical telescope, Hawaii's 10-meter Keck Telescope--an admittedly unworkable pairing of tool and task--the sky survey would take centuries to complete. Instead, Apache Point's new 2.5-meter optical instrument, the Sloan Telescope, will take its celestial census in just five years. IN A SMALL, WINDOWLESS CONFERENCE ROOM in the Enrico Fermi Institute, Don York, PhD'71, is looking for advice. Though a half-dozen U of C astronomy & astrophysics faculty--plus several post-docs, graduate students, and undergraduates--are working on the sky survey, today's informal meeting is one of a series to inform those who aren't involved. A professor in the department, York tells the six researchers before him, "The more minds from Chicago we have on this, the better." Click here to continue "How long does it take to chart 50 million galaxies?" Feature story, "A Conversation with Hugo Sonnenschein"